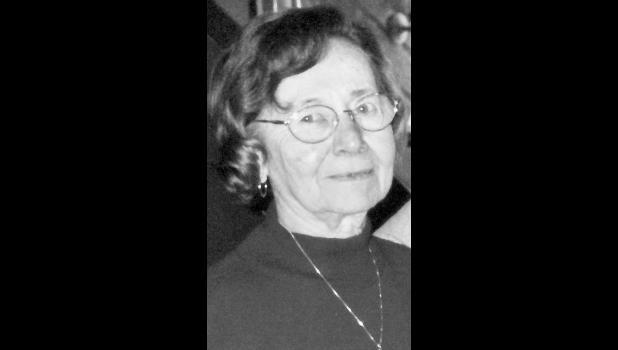 Doris Jeanne Bareiss Coffman Young, 93, Augusta, formerly of Holton, died Sunday, June 17, 2018, at Andover Courts in Andover. She was born April 19, 1925, on a farm north of Holton, the daughter of E.G. and Ruby Cramer Bareiss. She attended Lone Star and Columbia country schools, attended Colorado Grade School in Holton and graduated from Holton High School in 1942. Mrs. Young worked for Hinnen’s Grocery Store, Gossip Printing, Ben Franklin and Russel Variety Store and was a homemaker, all in Holton. In the 1950s she also worked in the Jackson County Probate Office as a deputy and was later appointed to the office of probate judge. She was a lifetime member of Evangel United Methodist Church, a member of the King’s Daughters and Sunday school class, as well as Chapter “P” of the P.E.O., the Tourist Club, and the Beck-Bookman Library. She was also a member of Holton Business Women, Holton Hospital Auxiliary, Holton Planning Board and Holton Cemetery Board. She married Dale E. Coffman on June 30, 1948. He died June 12, 1990. She married Francis A. Young on Aug. 3, 1996. He died Dec. 19, 2013. She was also preceded in death by a stepson, Steve Young. Survivors include a daughter, Teresa A. Rowell, Andover; grandsons Adam Rowell and wife Jessica and Seth Rowell; two stepsons, Doug Young and wife Kim, Topeka, and Greg Young and wife Terri, Holton; a stepdaughter-in-law, Marilyn Young, Topeka; stepgrandchildren, Kelly Schell and husband Jeremy, Dawn Koths and husband Brian, Chris Young and Alex, Brittany Young, Breann Hinman and husband Andrew and Donovan Young and wife Kelli; a great-grandchild, Riley Grace Rowell; and stepgreat-grandchildren, Loren Baldwin, Lila, Hank, Theo and Lawson Young and Brooklyn, Kellan and Kayden Hinman. Funeral services will be held at 11 a.m. Monday at Mercer Funeral Home in Holton. Burial will follow in Holton Cemetery. Family will greet friends one hour prior to service time. Memorial contributions may be made to the American Cancer Society or EUM Church, sent in care of Mercer Funeral Home, P.O. Box 270, Holton, KS 66436.